A Thanksgiving turkey surrounded by side dishes. In the United States, Thanksgiving is a treasured time for families and friends to come together and share a meal. It also presents an excellent opportunity to include people from different countries and cultures in an American tradition. International exchange program participants have the opportunity to learn American customs and values from their host families, peers, and mentors while in the United States. Americans benefit as they form lasting connections that help us better understand our interconnected world. For anyone looking to see how these connections impact our communities, the hashtag #ExchangeOurWorld offers a popular thread of conversation that reveals favorite moments and memories of exchange program participants and alumni. The Bureau of Educational and Cultural Affairs has compiled some examples of our exchange participants sharing Thanksgiving traditions over the years. Every year, Americans volunteer in their local communities and give back as part of celebrating Thanksgiving. Introducing exchange participants to the spirit of community service in the United States is a hallmark of many ECA programs, including the International Visitor Leadership Program (IVLP). 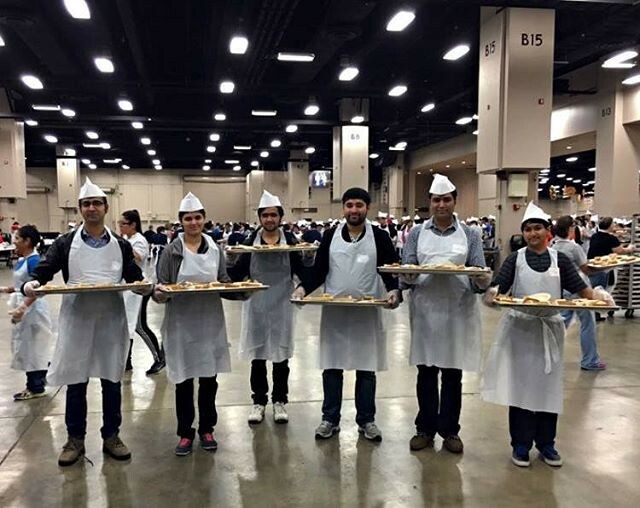 In 2015, Pakistani IVLP participants volunteered their time at the 35th annual Raul Jimenez Thanksgiving Dinner in San Antonio, Texas. The group was in San Antonio for meetings on promoting and encouraging tech start-ups and empowering young women and minorities through technology, as part of their 21-day IVLP exchange. The Future Leaders Exchange (FLEX) Program provides scholarships for high school students from Europe and Eurasia to spend an academic year in the United States, living with a family and attending an American high school. When Altynai, an exchange student from Kyrgyzstan, was in California as part of the FLEX Program, she helped prepare a Thanksgiving feast. “I liked this holiday... A huge turkey and bunch of food on the table... This is all what you need for happiness,” she said. And of course, Americans who travel abroad on ECA programs also have the opportunity to share aspects of our American culture and history with new communities. The Fulbright Program makes it possible for over 3,000 Americans from all 50 states to study, research, and teach abroad. When Kendra participated in the Fulbright English Teaching Assistant Program to Turkey, she taught her students about the history, the traditions, and foods of Thanksgiving. “And of course, we are making hand turkeys and talking about what we're thankful for,” she added. How will you open your homes, hearts, and communities to different cultures this year as a part of Thanksgiving? Learn more about how ECA exchange program participants see the world by following Exchange Our World on Instagram and joining the conversation with #ExchangeOurWorld on social media. About the Author: Becca Bycott is a Social Media Manager with the Bureau of Educational and Cultural Affairs.